– Wednesday 13th February: We hold the Big Quiz at least once a month and it is a particularly popular event. The theme of February’s quiz was Valentine’s Day. This was well attended by both residents and relatives, who all had a really great time. Congratulations to the Clydesdale unit for winning! – Thursday 14th February: The Valentine’s Day party was a great success. Our residents enjoyed cupcakes and Pina colada cocktails, whilst Jim Robertson entertained us by singing lots of romantic songs. – Thursday 21st February: Gordon Bowie entertained us all by playing the saxophone, clarinet and singing. He is extremely talented and we were all very impressed by his performance! – Monday 25th February: Stephen, one of our extremely dedicated carers, introduced his pet hedgehog to our residents. They were absolutely delighted to interact with Reggie and we hope that there will be more visits in the future! – Tuesday 5th March: In honour of Pancake Day, our residents were treated to pancakes with lots of different choices of toppings and everyone got the chance to taste them all. We also had a fun sing along with staff and residents. – Monday 11th March: Kirk James, a favourite with our residents, delighted us with an afternoon of country music. The event was well attended by residents and their families who all thoroughly enjoyed the performance. – Tuesday 12th March: We were visited by the girls from Tap Fit, who, as always, proved to be as popular as ever. Now visiting us once a month, they run sessions in all the units so that every resident can take part and enjoy. – Wednesday 13th and Thursday 14th March: In honour of Nutrition and Hydration week, we held some food-themed activities. 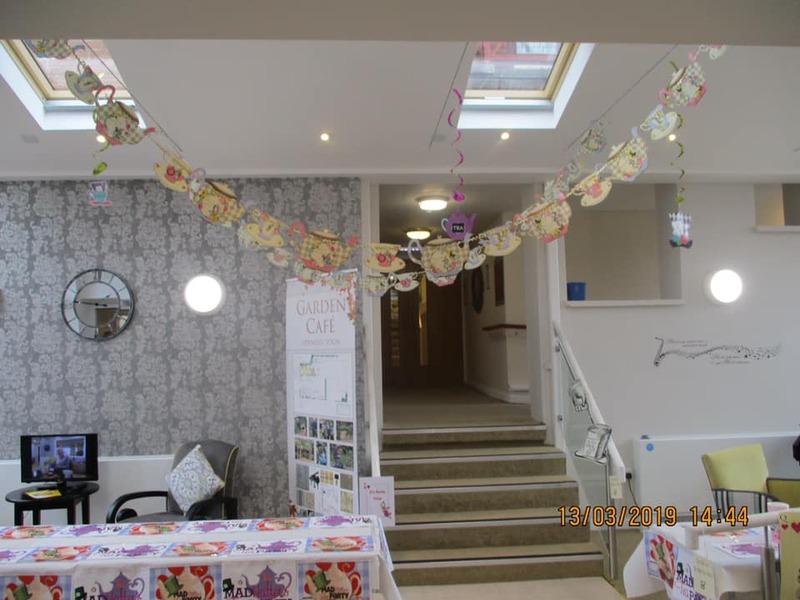 On 13th March, our residents enjoyed a Mad Hatters tea party in our lovely new Garden Cafe. They made their own hats throughout the week and were extremely impressed with all the decorations. On 14th March, our staff prepared a variety of fruits and juices for our residents to taste. Many residents had never tried a selection of the fruit that we provided them. This included passion fruit, mango, kiwi, fresh pineapple, oriental pear, figs and pomegranate . All tasted great and everyone certainly enjoyed themselves. – Monday 18th March: To celebrate St Patrick’s Day, Jim Robertson sang for us. The residents stole the show this time, with Willie and Frank taking to the microphone and various residents enjoying a dance. It was a fabulous day. – Thursday 4th April: We arranged a Cream Tea for our residents and their families to enjoy whilst they chose their horses for the Grand National. Congratulations to Mattie from Montrose Gardens who won £20 for the first horse, as well as all the other winners. Everyone really enjoyed the experience, so much so that we want to have another sweep for the Scottish Grand National this Saturday! – Tuesday 9th April: Andrea, one of our own carers, held a Karaoke session in Willowbank House, Montrose Gardens. Residents from other units were also in attendance and all had a fabulous time. A huge thank you to all of our incredible staff for organising these outstanding events. Your work certainly does not go unnoticed!